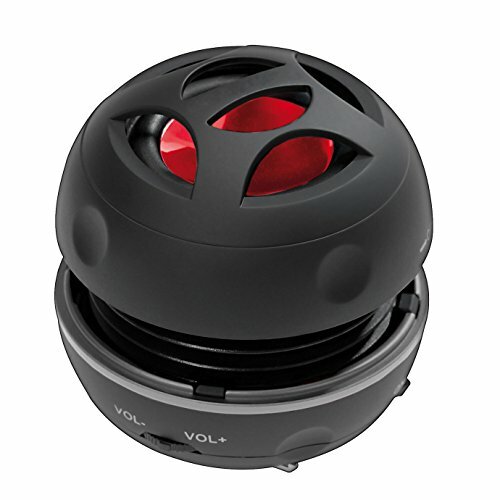 The I-vomBASS+ mini speaker is a rechargeable audio device producing high quality sound, with clear bass resonance. Now featuring a 45mm audio driver, which produces rich, full sound. The JYTECH BASS+ mini speaker has a strong and clear bass resonance. This is achieved by the speaker's innovative expandable bass chamber. Link JYTECH BASS+ mini speakers together via the built-in audio lead, creating a chain of powerful portable speakers. The JYTECH BASS+ mini speaker arrives in premium gift packaging. Compatible devices: Apple iPhone, iPad, iPad Mini, iPod, Android Phones and Tablets, Laptops, Computers and any other device with a 3.5mm earphone port. Enhanced Bass+ Expansion System (BES) enables Full-bodied, 360-degree superb sound - 45mm Driver 3-Watt Output. Compatible with all audio players with a 3.5mm audio socket/stereo headset jack, including Apple iPod Touch, iPhone, iPad, MP3/4 Players, Laptops, MacBook, Samsung and PC Computer. The portable mini speaker charges using our included standard USB cable, which connects to a PC, laptop, usb power adapter or standard USB port. If you have any questions about this product by I-VOM, contact us by completing and submitting the form below. If you are looking for a specif part number, please include it with your message.